A weekly newspaper has become a broadsheet again for the first time in decades as part of a press war in a seaside town. The Eastbourne Gazette has switched from tabloid to broadsheet this week as part of a relaunch at the Johnston Press title, which has seen it adopt a new old-fashioned gothic masthead. It comes as Newsquest prepares to launch a new weekly freesheet in the town called the Eastbourne Independent, which is set to hit the streets for the first time on Friday. The Gazette began life as a broadsheet when it was launched in 1859 but has appeared in a tabloid format for many decades. The first edition of the new-look broadsheet Gazette. The Gazette is a sister title to the Eastbourne Herald, which will remain in a tabloid format. Editor-in-chief Gary Shipton said: “I am hugely proud of what we have achieved. The Gazette looks fantastic and we’ve already received some amazing feedback. “Of course, not everyone will immediately love the new format – and we are very happy to hear all comments. 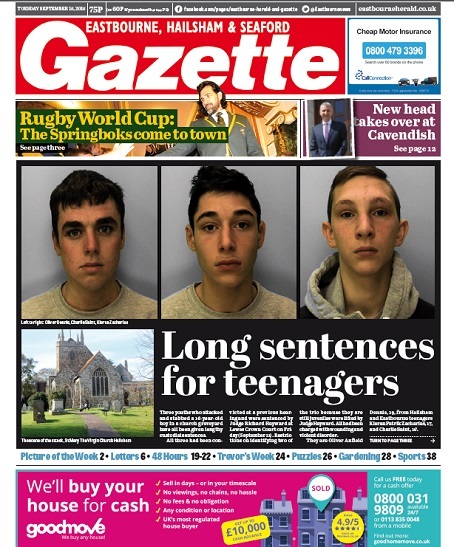 The cover price of the Gazette has remained at 75p and the new masthead is in line with those of sister papers the West Sussex Gazette and Horsham Gazette. Consulting editor Keith Ridley has also been involved in the relaunch of the Gazette as a broadsheet, after leading the titles for many years in his role as editor-in-chief of JP’s East Sussex titles, which he left in February. In a piece about the relaunch, he wrote: “The Eastbourne we love and cherish is changing for the better. Now, so too is your Gazette. Newsquest’s new Eastbourne Independent, which will launch this Friday, will be edited by Peter Lindsey, a former editor of the Eastbourne Herald and Gazette who lost his job in 2009 as part of cost-cutting measures. The launch by comes just two months after Johnston Press acquired the free weekly Brighton & Hove Independent, which runs in competition with Newquest’s city daily The Argus. Last week’s tabloid edition of the Eastbourne Gazette. I’m practically speechless – it looks like a giant comic! Perhaps it’s a sign of old age on my part, although I never did like broadsheet for weekly papers. All very good, but what seems to have been achieved is more ads on the front page. Question. If it was so loved as a broadsheet why was it changed? Answer. Victim of JP one size fits all policy which ripped the heart and character from some once very good weeklies in Sussex and elswhere. The front is a mess despite Mr Shipton’s predictable bluster. If I was an advertiser, I would be seriously underwhelmed. The way the front has been designed is an absolute mess, with the ads stacked on top of each other in a way that will reduce response rates. It’s a broadsheet, so none of the adverts will be visible on the shop shelf when it is folded. That splash headline is incredibly uninspired, as is the story itself. There is also something undeniably bonkers about a tabloid-to-broadsheet conversion. Rather than a bold reinvention, it feels like the last dying twitch of a dinosaur’s tail. Shippers is happy though, so all is well. ‘Top end market gazette’ jeez! If that’s their idea of how a high quality/ top end front page should look I think I’d wave the white flag now, it’s simply a tabloid padded out with a jumble of some of the worst word filled ads I’ve seen in ages thrown together to fill the rest of the broadsheet size. ‘….The Gazette looks fantastic and we’ve already received some amazing feedback. Really? He must be surrounding himself with yes men if he believes this? It’s just a complete mess, a huge backward step and how they have the nerve to charge anything for this free sheet clone is beyond me. Welcome to the 1970s everyone. One small step for Eastbourne one giant step backwards for the regional press. I’m sorry to say that this is the last throw of the dice for the Eastbourne Gazette. With less than 2,000 copies being sold, the move to broadsheet represents a throw-back to years gone by. It really is desperate and Editor Gary Shipton has nailed his reputation to this bizarre move. His edict to editorial staff in Eastbourne is also peculiar. 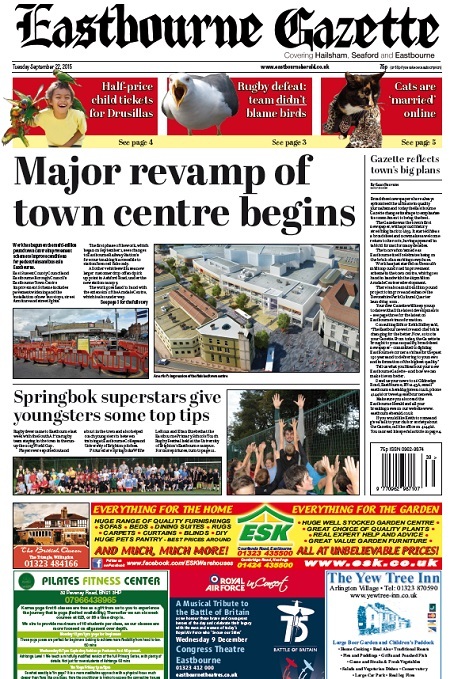 It says only good news will appear in the relaunched Gazette, which meant instead of a front page splash about its local hospital going into special measures, readers were given an old story with one line of new news about the town centre’s redevelopment. It’s a shame that instead of switching format, JP didn’t invest in more editorial staff for this project. If it had, maybe it might have some real stories to entice readers back in, instead of being filled with a load of press releases. What a complete and utter dog’s dinner of a front page. Dear, oh dear, oh dear. The front page still looks like a tabloid – all they’ve done is stack the ads below it. The ad block is hideous. The RAF concert ad appears to be some odd part of a T-shaped ad because it shares the same red as the ESK ad above. In any case, the dreadful ESK ad should be at the bottom of the page, under the others, as an anchor and reflecting the contents promo below the masthead. Someone with sense in advertising should be sent to negotiate a better look for the garish, jumbled low-rent Esk ad, which is not in keeping with broadsheet style. Space is needed between the ads. The skinny landscape Springboks photo should never have run immediately above the ESK ad. Really it should have been used inside where broadsheet design allows you to give it some wellie, and perhaps trigger additional sales because of the many people in it. If it had to run on the front it would have been possible to put the text between the photo and the Esk ad to create a break. What a great move by JP to distinguish itself with the Gazette, clearly suited to the Eastbourne demographic. I enjoyed reading it and will continue to do so. Nothing like a comic, unlike most of the commentors on here – who surprisingly no longer work in the industry in the main. Says it all…. I quite like the idea of reverting to broadsheet. Most tabloids lack gravitas – all headline, no substance. However, there are one or two glaring faults here. The stacked ads are an eyesore and reduce their effectiveness. The ‘ragged right’ text used for the stories is truly awful and the picture choice uninspired. The titlepiece (not masthead, incidentally) is more impressive than most of the bland sans versions we get nowadays, but there is something oddly 1930s Berlin about it. I’d have preferred a less ‘square’, more elegant, old English face. I’m afraid the ‘good news only’ idea – if true – is a no-no. It suggests news manipulation and never works. Good news often bores the pants off readers, and newspapers have a responsibility to tell it like it is. On a postive note, I welcome editors making changes to stay afloat in what must be very trying times. I wish the Gazette well and hope it flourishes in its new format. I’ve introduced this newspaper to a few of my relatives and they think it’s great, very in-depth and informative, whilst enjoyable at the same time. The new masthead looks marvellous, although I do think they could have designed the front cover better. Let’s hope that this revitalises the Eastbourne Gazette; there’s still life in in yet!